Abby Blass is a PhD candidate in political science at the University of Texas at Austin. Her primary research area is comparative judicial politics. She uses quantitative and qualitative research methods to explore the ways institutional design shapes judicial behavior, and the causes and consequences of formal judicial empowerment over time. Abby earned a bachelor’s degree in political science from the University of Michigan in 2004. Abby’s dissertation compares judicial behavior in systems of weak, intermediate, and strong-form constitutional review (the UK, France, and US, respectively). 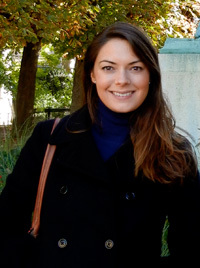 She conducted fieldwork for her dissertation as a visitor at the University of Oxford Centre for Socio-Legal Studies (2012-2013) and at the Center for European Studies at Sciences Po Paris (2011-2012). Her research has been supported by a Macdonald research fellowship, a Long research fellowship, and a FLAS dissertation research fellowship from the Center for European Studies at the University of Texas at Austin. Abby also conducts research on high courts in Latin America since the third wave of democratization (1975 onward) with Daniel Brinks. They explore the creation and maintenance of systems of judicial review, arguing that high courts in the region are best understood as central components of a system of governance—not wholly or primarily as checks on political power or guardians of an original pact—and show that broader, more inclusive constitutional coalitions design courts with more formal autonomy and authority. Abby’s research with Daron Shaw and Brian Roberts testing the logic of the Supreme Court’s campaign finance decisions regarding the purported chilling effect of perceptions of government corruption on political participation was published in the Election Law Journal, and her work with Sean Theriault and Patrick Hickey on voting behavior by members of Congress was published in the Oxford Handbook of the American Congress. Abby is a researcher for the Comparative Constitutions Project, an NSF-funded initiative to collect data on the formal characteristics of written constitutions for all independent states since 1789 in order to investigate the sources and consequences of constitutional choices, directed by Zach Elkins and Tom Ginsburg. Abby can be reached at ablass@utexas.edu or abby@abbyblass.com.